In the past decade, more than 4,000 motorcyclists died each year, according to the Highway Loss Data Institute . As motorcycle weather approaches, help reverse the trend by protecting yourself and your passengers with these five tips. Don't bite off more bike than you can chew when shopping for your first motorcycle. Digitaltrends.com suggests beginner motorcyclists buy a standard bike, such as the Kawasaki Ninja 300, the Suzuki SFV650 or the Honda CBR250R. They have average power with good handling, making it easier to take on the sometimes rough conditions on the road. Make sure the bike fits you, meaning it isn't too heavy to lift if it falls over, the seat isn't too close to or far from the ground, the handlebars are at a comfortable angle and height and the seat has the right feel. Try several bikes to gauge your favorite fit. 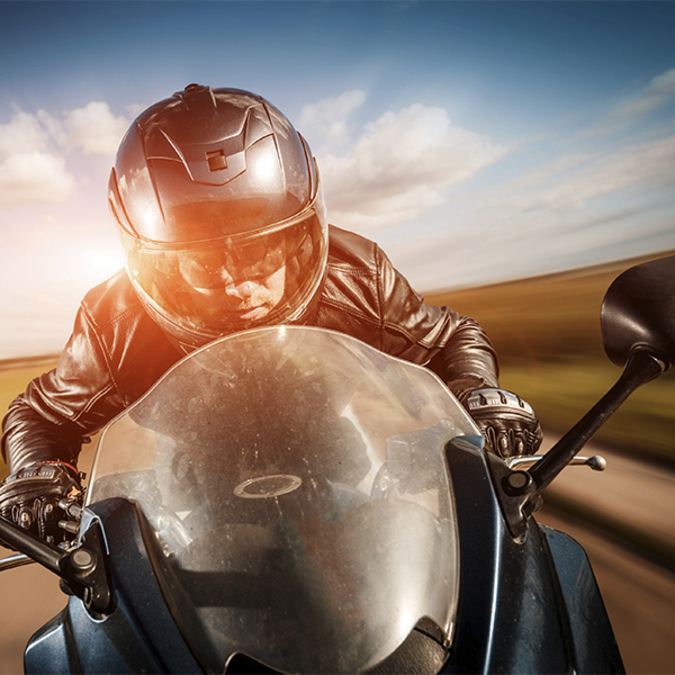 Whether you're new to motorcycles or a seasoned veteran, the Motorcycle Safety Foundation offers resources and classes to help you improve driving ability and safety on the road. Completion of certain classes could also qualify you for an insurance discount and may allow you to waive the road test or written portion of the motorcycle licensing process. Not all helmets are equal and, if your helmet is older than five years, it's time to think about getting a new one. Additionally, only certain models are sold as motorcycle helmets. "A motorcycle helmet manufacturer would have to submit a helmet model to testing to the following regulations to meet DOT standards and the right to place the DOT sticker on the back of the helmet," according to webbikeworld.com . Helmets that don't meet requirements cannot be sold as motorcycle helmets. When you think of motorcycle clothing, you may picture black leather pants and jackets. Protective clothing is important, but it's also important to make yourself visible to other drivers. Whether it's choosing a bike with a colorful paint job or wearing a bright helmet and reflective vest over your jacket, stand out against the black backdrop of the asphalt road. There's no way to drive too defensively when you're a motorcycle rider. Complex Sports writer Janaki Jitchotvisut recommends riding as if, any moment, a car is going to appear in front of you. "You can't do anything about other people on the road," Jitchotvisut writes. "What you can control is how you ride. Pay absolute attention before and at every single intersection. We're not just talking street corners. We also mean alleys, parking lots, drive-thrus, gas stations, anywhere a vehicle is going to try to enter moving traffic from a stand-still." Also come to terms with the fact, no matter how safely you drive, you may still end up in an accident at some point. Accident victims need to find an attorney they can trust. The attorneys at Ed Bernstein & Associates have more than 40 years of experience in personal injury law and understand its finer nuances. Visit edbernstein.com or call (702) 240-0000 to find out how to get started on the road to recovery.